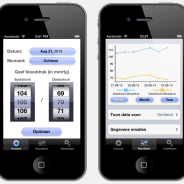 With the Blood pressure tracker app you can easily track your blood pressure over time. Your blood pressure will be displayed in a graph that is easy to read and interpret. You can enter your blood pressure at different times during the day. You can also indicate in what pariod of the day the measurement was made. You can also set a daily reminder to help you remember to measure your blood pressure. In the full version (available as in-app purchase) you can also add notes, track measurements for multiple users, email the results, and track your heart rate. The is developed natively for iOS. For our tracker apps we have developed the JAPPS survey library.